Grace Church Goodmayes is situated on the northern side of Ashgrove Road, near the main road. While the church advertises itself as a lively, informal church, the building itself and the rough car park outside it looks less inspiring. It must have been close to the now-lost Goodmayes Presbyterian Church, which was somewhere on Goodmayes Road. That was formed in 1905 in an iron building. A permanent church was erected in 1912 but was demolished, probably after 1972. The Roman Catholic Church of St Cedd sits on the northern side of the High Road in Goodmayes, a little to the west of Goodmayes Road, on the corner with Blythswood Road. 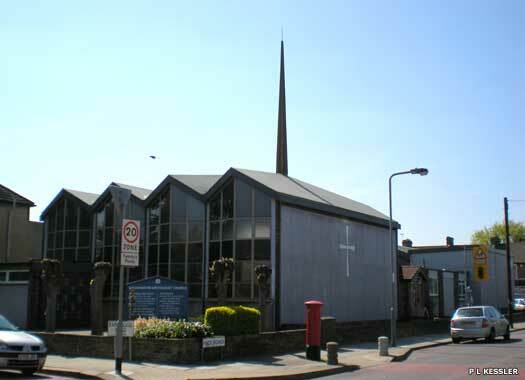 The Catholic parish was formed in 1966 by purchasing the former Goodmayes and Seven Kings Wesleyan Methodist Church. This opened in 1902 as an iron church, replaced by the present building in 1904. 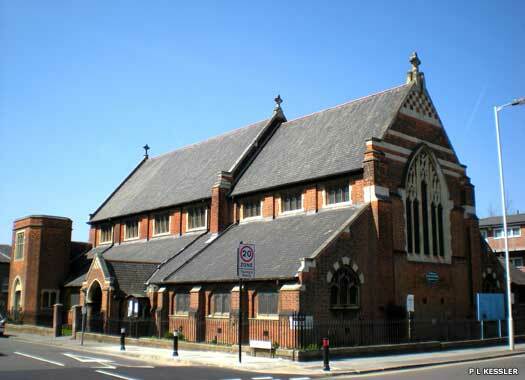 Between 1923-1966 it was demoted to serve as a church hall before being sold. The Parish Church and Community Centre of St Paul Goodmayes lies on the north-west corner of Barley Lane and Atholl Road. 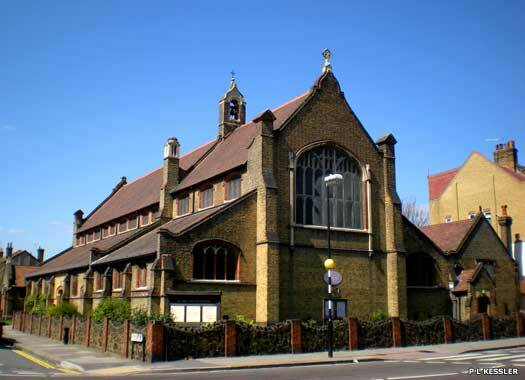 Initially, this area was part of the parish of St Mary Ilford and then, from 1895, St Chad Chadwell Heath, but it was still growing rapidly. 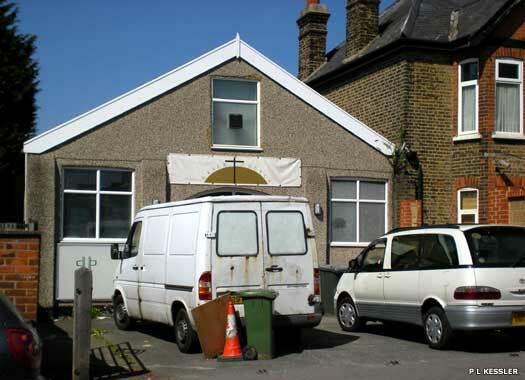 Makeshift services were being held 'Chadwell Board School' but a new church was clearly needed. The present site was purchased in 1901 and building work on the Lady Chapel was completed in 1903. Services were held in the Lady Chapel while work on the nave and side aisles continued. This was completed towards the end of 1915. The church remained a chapel of ease to St Chad until 1917, when it gained its own parish. The building is in the Perpendicular style, in red brick with stone dressing, with an aisled and clerestoried nave, west baptistery, chancel, organ chamber, and two south porches. The building was completed by a further addition in 1929. 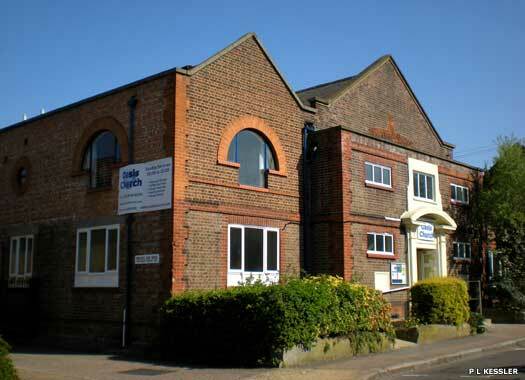 Oasis Church occupies the fairly large premises of Oasis House, on the eastern side of Essex Road, which is a short stub road leading south from the High Road in Goodmayes to a mixture of surviving Victorian terraced houses and new housing next to the railway. 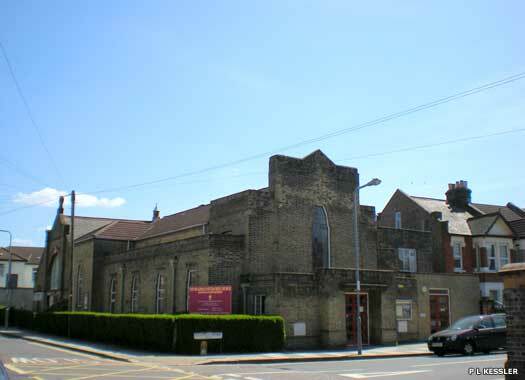 The church, which may have served other uses in the past, is a fully independent body on the western edge of Chadwell Heath, not governed by any other organisation. It also runs a homeless unit. Goodmayes Methodist Church occupies the southern side of Percy Road between Wellwood and Eastwood roads. 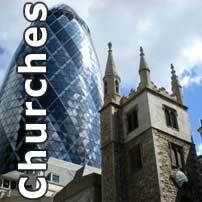 It began as a Wesleyan church with open-air services led by Arthur Tatchell, who was later a medical missionary in China. In 1900 an iron building was erected in nearby Blythswood Road, and in 1904 the permanent church was built, with a choir vestry being added in 1927. The current building appears to be a late-twentieth century replacement of it. Goodmayes Hospital Chapel of St Mary formerly stood at the spot pictured (in 2004), immediately south of the central hospital buildings on the western side of Barley Road. 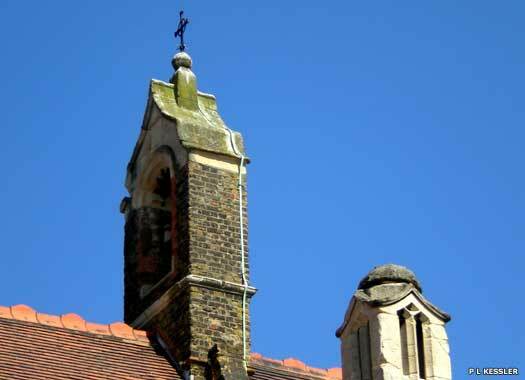 The hospital was founded as Ilford Asylum in 1898, opening in 1901, which is probably when the chapel was also opened. Under the NHS, the hospital became known as Goodmayes, but no images of the chapel can be found. 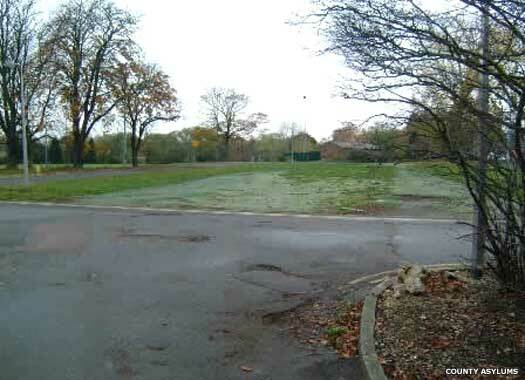 It was later demolished and the site subsequently used as a grassed car park. Seven Kings United Free Church (Baptist & United Reformed) is on the southern side of Meads Lane, between Norfolk and Elgin roads. Its roots as Seven Kings Congregational Church go back to 1653. The church was opened in 1902. A hall was added in 1907 and a new church built in 1936. In 1972 it became United Reformed. In 1982 the members of Seven Kings Baptist Church abandoned their old building and merged to form the current United Free church. St John the Evangelist is on the north-west corner of Aldborough Road and St John's Road in the area of Newbury Park, which is immediately south of the busy Eastern Avenue thoroughfare. 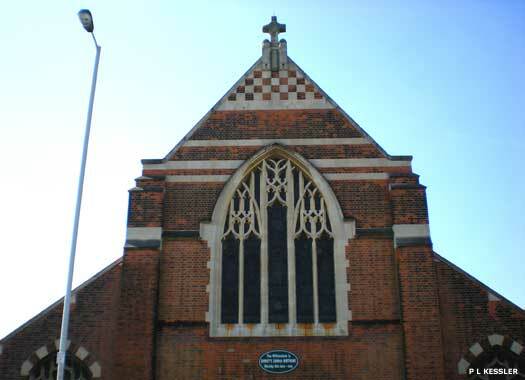 Local Anglican services for the district were started in the Central Hall, Seven Kings, in the parish of St Mary Ilford in 1900, as the distance to the parish church and the growing number of parishioners in the area made it impractical for them all to visit St Mary's itself. Construction of the new church on the present site swiftly followed, so much so that the completed building could be dedicated in 1903. Just one year later a new parish was created out of part of St Mary's district. 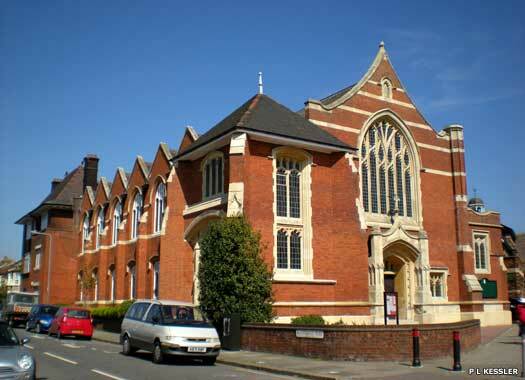 The church is a large building of brown stock brick with red brick dressings, designed in the Perpendicular style by J E K and J P Cutts. It has an aisled and clerestoried nave, a chancel flanked by chapels, and a bell cote at the end of the nave. One photo contributed by County Asylums.